This is the first time I am reviewing a magazine on this blog and am happy that I got to review something I enjoyed reading immensely. I normally watch a lot of programs that pertain to science , technology, history and nature on television. Not surprisingly, I finished reading two copies of the magazine in a couple of days and wanted to go pick up the old issues. A bit about the magazine before i tell you what I liked reading..
BBC Knowledge was launched in 2008 in the US and went on to become one of the most successful launches of the year. Subsequently, the magazine was launched in 2010 in India and is from the stable of Worldwide publishers,the publishers of Femina , Filmfare and many more magazines. The magazine is a bi-monthly and contains content that is international,but hand-picked for the Indian audience. Aptly titled "For the curious mind", BBC knowledge covers a wide range of topics from Science, History and nature. I loved reading the magazines that I had been sent for reviewing and loved how each issue covered a plethora of issues and topics. Let me give you a rough idea of what one of the issues had on offer (Jan-Feb 2011 issue). The issue contained an interesting article about Espionage in 21st century ; a lovely feature on the Sumatran Rhinos that sing ; an in-depth write-up about the building blocks of "Genius "among a host of other invigorating reads. 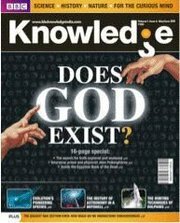 The other issue that I was sent had a special report on analysis of whether God exists-a truly awesome read !. I also loved flipping through glossy science/history/nature related pics in the magazine.Another section I absolutely loved reading was the Q and A section where queries of readers are answered by a team of experts. The articles are lucid, interesting and written by highly qualified writers, journalists and academics. And just like their tag-line promises, this magazine is a treasure trove for curious minds. Priced at 100 bucks per issue, BBC Knowledge might seem a little expensive for a young reader, but quite honestly I don't think there are too many knowledge-oriented magazines that has the quality (both in content of articles and in visuals accompanying the articles) that this one has. It would be nice to read more India-centric articles and content from India being published in the magazine.I am sure this will soon follow as the subscriber base in India grows. My recommendation: Go grab it from your nearest newsstand to lose yourself in pursuit of knowledge. Disclosure: Two copies of the magazines were supplied for review.All opinions expressed here are mine and mine alone. veens.. Sure, it is ! What's the depth and detail that articles venture into? Is it advanced or just a soft read?